You can’t get too far in a discussion about the nation’s electric power sector without running into the question of costs. How do renewable sources, such as solar and wind, stack up against fossil fuels, such as coal and natural gas? How much will it cost utilities and ratepayers to build—and operate—a new power plant? To illustrate how the various energy technologies compare, we’ve created a set of interactive dashboards that summarize how much it costs to generate power. The data show that utility-scale solar and wind installations are now competitive with conventional coal- and gas-fired power plants. Moreover, wind and solar costs are projected to steeply decline in the years ahead. Before delving into the data, it’s worth noting that the number of dollars it takes to build and operate a power plant is a somewhat narrow definition of costs. It doesn’t, for example, include what economists call externalities, such as the cost of air pollution or climate change impacts. With a broader definition of costs, low-carbon technologies would perform even better than fossil fuels. Our dashboards present data on what’s known as the levelized cost of energy. In essence, this analysis offers an apples-to-apples comparison of the costs of financing, building, operating, and maintaining a power plant. The values are expressed in dollars per megawatt-hour. Other forms of solar power are expected to get even cheaper in the next few years. The graphic below shows that rooftop residential solar costs are expected to decline 42 percent between 2014 and 2017; for commercial and industrial photovoltaic installations, Lazard forecasts the levelized cost will drop 28 percent over the same period. 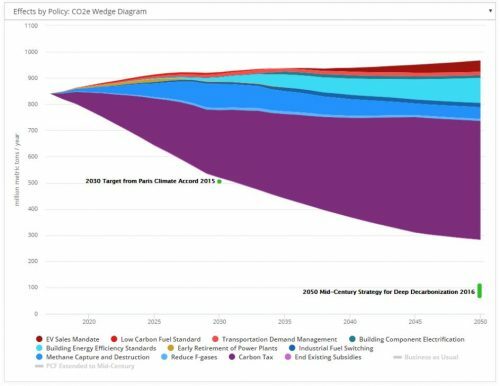 “More efficient installation techniques, lower costs of capital and improved supply chains” are the driving forces behind these projected cost reductions. A variety of considerations—aside from cost—determine when, where, or how a technology is used. Although wind and solar are now cost-competitive and offer many health and environmental advantages over fossil fuels, these are still considered intermittent sources because the sun isn’t always shining and the wind isn’t always blowing). As a result, wind and solar are unable to entirely replace the services that certain conventional “baseload’” sources provide to the system. That said, utilities and power operators are discovering a multitude of new ways that low-carbon technologies can offer more value to the power grid across the board. Transmission is another important issue, especially for power sources that are limited to certain areas, but it can also allow power plants to serve faraway customers. The U.S. Energy Information Administration’s Annual Energy Outlook provides a different set of levelized cost figures for a variety of technologies. The National Renewable Energy Laboratory also offers an online calculator that lets you plug in variables, such as capital and fuel costs, to generate LCOE estimates. To learn more about Energy Innovation’s work on clean energy, visit our power sector transformation and smart energy policy pages.